Japan’s Yuzuru Hanyu performs his Free Skate at the 2017 World Figure Skating Championships. Japan’s super star Yuzuru Hanyu heads with confidence and optimism into the Olympic season following a year with some firsts. 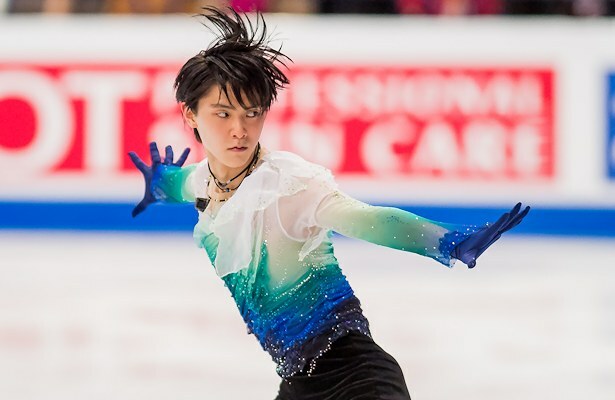 Hanyu has joined the “quad king club,” becoming the first skater to land a clean quad loop in competition last fall at the Autumn Classic in Canada. By the time the World Team Trophy came around, he went for five quads in his long program and landed four of them, including a new quad toe-half loop-triple Salchow combo towards the end of the routine. The Olympic Champion feels now he has the arsenal he needs for his next big quest – defending his Olympic title – but has not thought about changing his jumps. He is still unsure if he will have five quads in his long program at the beginning of the season. So Hanyu can more or less check off the technical side, however, he obviously needs to make sure he is consistent as he has popped some jumps a few times. This happened to him in the short program at Worlds and the World Team Trophy and he needed to catch up in the free – which he did superbly, especially at Worlds. “I need to take some time to analyze what is the problem with the short program, because I am starting to have a negative image of the short in general,” the Four Continents silver medalist pointed out. He was pleased with his new jump, the quad loop, though. The next step now is mounting new programs, however, at press time, the skater had not yet decided on the music for next season. Even though Hanyu is currently one of the best skaters of our time with the complete package of technical difficulty with his three different quads and artistic expression, he has to deal with disappointment sometimes when making errors in the short program at Worlds and the World Team Trophy. When disappointment strikes, the Olympic champion takes it hard. After the short program at the World Team Trophy, a lot of things went through his mind. The World champion talks through things with his coaches and other people close to him, but in the end, he thinks about it a lot by himself. There is a lot of pressure on Hanyu every time he steps on to the ice. His numerous fans, the spectators in general, the media all expect him to deliver. The ice rink becomes a sea of Japanese flags and the cheering is deafening when the star takes the ice. What does he feel in this moment? The World Team Trophy, where Team Japan took the gold medal for the second time since 2012, turned out to be an energy booster for Hanyu. “I had a lot of fun at this event and it was the first time in a while that I was able to enjoy a competition so much,” he revealed.